In the last few years, the Vavilov Ice Cap in the Russian High Arctic has dramatically accelerated, sliding as much as 82 feet a day in 2015, according to a new multi-national, multi-institute study led by CIRES Fellow Mike Willis, an assistant professor of Geology at CU Boulder. That dwarfs the ice's previous average speed of about 2 inches per day and has challenged scientists' assumptions about the stability of the cold ice caps dotting Earth's high latitudes. "In a warming climate, glacier acceleration is becoming more and more common, but the rate of ice loss at Vavilov is extreme and unexpected," said Mike Willis, CIRES Fellow and lead author of the paper published this week in Earth and Planetary Science Letters. Glaciers and ice caps like Vavilov cover nearly 300,000 square miles of Earth's surface and hold about a foot of potential sea-level rise. Scientists have never seen such acceleration in this kind of ice cap before, and the authors of the new paper wrote that their finding raises the possibility that other, currently stable ice caps may be more vulnerable than expected. For the new assessment, researchers played the part of forensic ice detectives, piecing together the ice cap's deterioration by spying on the advancing ice with remote sensing technology from a constellation of satellites operated by DigitalGlobe Inc, headquartered in Westminster, Colorado. The project also relied on support from the National Science Foundation and the National Geospatial-Intelligence Agency, which funded the development of high-resolution topographic maps of the Arctic. 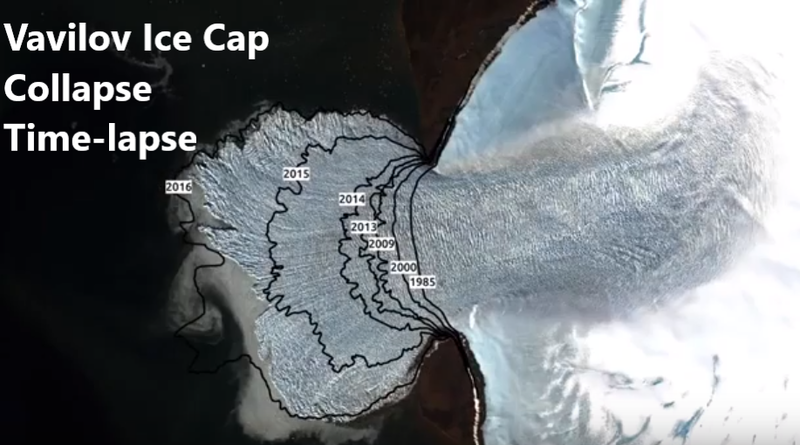 By satellite, they watched ice on the cap creep slowly forward for several years, before it accelerates slowly in 2010, surging rapidly forward in 2015. The initial very slow advance is thought to have been caused by a shift in the direction of precipitation that occurred about 500 years ago. Before this time snow and rain came from the southeast after this time rain and snow came from the southwest. As the western part of the ice cap advanced into the ocean, the ice surged forward. "Cold" ice caps, like Vavilov, occur in polar "deserts" with very little precipitation, and they're normally frozen to their beds, flowing only due to bending of the ice under the force of gravity. With beds above sea level, they are normally insulated from the kinds of changes that have hit glaciers in less frigid regions: melting from below by warm sea water, for example, or sliding faster when warm surface meltwater drains to the bed of the ice. Researchers suspect the ice cap began to dramatically advance when the bottom of the ice cap became wetter and the front of the glacier advanced onto very slippery marine sediments. The ice began to speed up, and friction caused some of the ice underneath the glacier to melt, which supplied more water to the bottom of the ice, reducing friction, which caused the ice to speed up, which in turn, again produced more water. Some of this water might have combined with clay underneath the glacier, reducing the friction beneath the glacier even further and allowing the truly extraordinary sliding speeds to occur. By 2015, the sediments and rock at the bed beneath the ice had become so slippery that the material couldn't stop the ice from flowing. It took just two years for the ice cap base to reach that tipping point, transforming into a near frictionless zone, which is well-lubricated and highly mobile. The glacier continues to slide today at accelerated speeds of 5-10 meters per day. The Vavilov Ice Cap thinned by a total of a few meters, advanced about 2 km, and lost about 1.2 km3 in total volume into the ocean in the 30 years before the speedup. In the one year between 2015 and 2016, the ice advanced about 4 kilometres and thinned by about 100 meters (~0.3 m per day). The ice cap lost about 4.5 km3 of ice, enough to cover Manhattan with about 250 feet of water or the entire state of Washington with an inch. And it's unlikely the ice cap will ever be able to recover ice mass in today's warming climate, the paper states. Many scientists have assumed that polar ice caps that sit above sea level will only respond slowly to a warming climate -- but the authors of this study urge that this assumption is questioned. The rapid collapse of the Vavilov Ice Cap has significant ramifications for glaciers in other polar regions, especially those fringing Antarctica and Greenland. "We've never seen anything like this before, this study has raised as many questions as it has answered," said Willis. "And we're now working on modelling the whole situation to get a better handle of the physics involved."